I have had my Chinese pepper bonsai for almost a year now. For the summer months my tree was great. The leaves were nice and green and everything was great! Now the leaves are yellowing and are falling off. There are green leaves keep growing but the amount that are turning yellow and are falling off are happening more frequently than the green ones growing. I wanted it was the emersion technique when the soil becomes dry for 10 minutes in tepid water. I have it in a window cove where it gets the light. Now its winter I don't have my windows open anymore so I'm wondering if it's maybe lacking sufficient carbon dioxide? Also I have never furtilised it yet as it was going good until now and didn't feel confident with what I was doing. Also, the soil seems quite fine but there is a slight moss in some places and there are some small roots shooting out of the trunk where it meets the soil. Do I just fertilise it and see what happens? or do I repot it with new soil after pruning the roots? Or is it simply a case of over watering now that there are less leaves and less sunlight? Any help would he greatly appreciated. I really love the tree and would hate for it to die. Fertilizing a Bonsai is essential to its health because nutrients in the soil are washed away with each watering. Fertilizer is like vitamins and minerals for a plant. When new growth appears in the spring, itâ€™s time to start feeding your Bonsai. Use an organic liquid fertilizer or a chemical fertilizer diluted to one half strength. Most Bonsai should be fertilized once or twice per month during the growing season and once a month in the winter. Water your tree BEFORE fertilizing. DO NOT FERTILIZE A WEAK OR FRESHLY REPOTTED TREE! This will cause stress to the tree by burning the roots. You have been washing away all the nutrients and there aren't very many to start with in such a tiny amount of soil in a bonsai pot. The more soil a plant (any plant) is in the better it can take care of itself -- put a tree in the ground and you don't really need to fertilize it at all. Move the same tree into a large tree container and you have to fertilize it once or twice a year as the soil it is in gets depleted. In a bonsai pot, it is mostly dependent on you and needs regular fertilization as above. And the ultimate in that progression is soil-less, hydroponic growing, where whatever you are growing is completely dependent on you and needs continuous fertilization. So your tree has been indoors the whole time? Do you mist it? Indoor air is very dry, ESPECIALLY in winter when the heat is on. Houseplants generally and your chinese pepper for sure, benefit from daily misting of the leaves. Chinese pepper trees need bright indirect light. Your window, depending on how it faces and what is around it, might be either too much or too little light (or even both - if it gets a few hours of intense direct sun, that could be too intense and still not be enough hours of light). I think indoor trees in winter with less hours of sun and more cloudy days etc, should really have some artificial lighting, but that has to be a dedicated lamp just a few inches above it. In general we say don't fertilize a tree that is struggling, but since your tree is likely struggling at least partly due to lack of nutrients, my suggestion would be to fertilize it with half strength liquid fertilizer now and then once a month after that until it is healthy again. 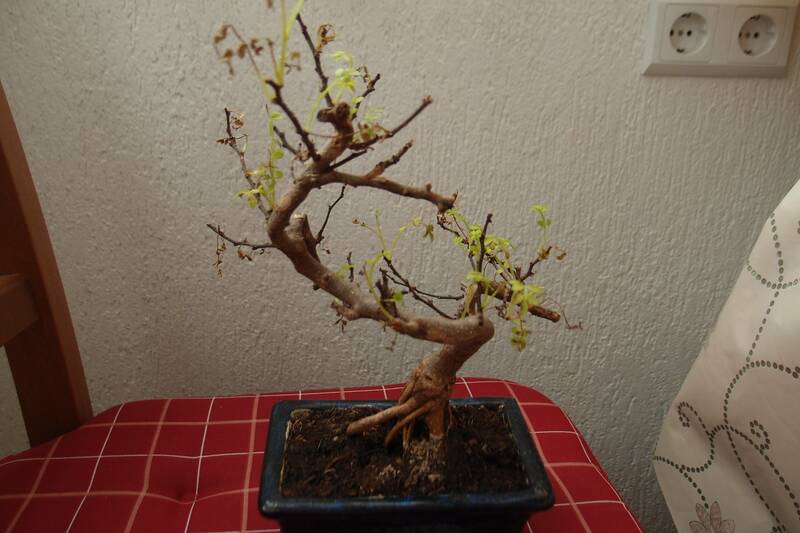 In the spring, it should be root pruned and re-potted in good bonsai soil. I'm guessing yours is probably in something more like potting mix, heavy in peat moss, which holds too much water for too long. Bonsai soil is very loose and free draining and mineral. Thank you very much for your warm welcome and your prompt and extensive reply! I have been watering it once the soil has gone dry. Admittedly the water was just higher than the pot so it was just touching the trunk. I also let the water drain out before putting it back on its stand. I did start misting it when things started to change but I had recently stopped because I was worried I was already over watering but will start again! Also, glad you informed me of the moss being an indication of too wet as now I know I'm probably over watering it! My Chinese pepper sits in a cover window and receives sun light through half opened blinds. At the moment the sun is not high enough over the roof tops to give it direct sun light. I will fertilise it and not water it so much. I will also continue to mist it every day like you have recommended! Furthermore I won't fill the sink as much as I have done and will water it when the top soil is dry. I will continue this and hopefully it'll grow strong again! Once again thank you very much for your reply. I really appreciate it! I will post back after Christmas to let you know how it is getting on! P.s. I'm from North East England! I will also attach a photo from August and a recent photo! I also have the same tree, and I didn't fertilize it since I bought it (I bought it in September 2015). It lost almost all leaves, now there is maybe 20% of the leaves it used to have. The leaves are drying out and falling out. Maybe I made a mistake to take the tree out as it was around 6-7 degrees (and I keep it indoors, by the window at room temperature), and than took it in several times the last week... Now I think that may be the reason, or the fact that I didn't fertilize it... What do you think? Took it in several times also must mean you took it out several times? In and out is very bad for trees - think about how they grow, rooted in one spot. Going from room temp to 44 deg F is a big shock. Usually to take a tree out, you would wait until outdoor temps are closer to indoor temps and then acclimatize it a bit gradually. And then LEAVE it out, until it is time to bring it in for the fall. So you have been shocking its system. AND you have been starving it. Read what I wrote earlier in this thread about the importance of regular fertilization for bonsai - bonsai are in such a tiny amount of soil and then the nutrients in it get flushed out by all the watering. They have to be regularly fertilized, usually once a month in winter and twice a month when it is growing faster. rainbowgardener wrote: Took it in several times also must mean you took it out several times? In and out is very bad for trees - think about how they grow, rooted in one spot. Going from room temp to 44 deg F is a big shock. Usually to take a tree out, you would wait until outdoor temps are closer to indoor temps and then acclimatize it a bit gradually. And then LEAVE it out, until it is time to bring it in for the fall. So you have been shocking its system. Thanks so much for the reply, rainbowgardener. I realized I made a mistake doing this, now I don't know what to do next. I guess I should fertilize the tree, right? But, it is not recommended to fertilize when the tree is weak. Also, apparently it should not be fertilized in winter months only. However, maybe it needs the nutrients badly. So I am pretty much confused at this point; should I fertilize it or not? Did I kill my tree or just shocked it and it will soon feel better? What would you do? Last edited by Veritatem Aperit on Sat Mar 12, 2016 8:34 am, edited 1 time in total. I don't know where you got the idea only to fertilize in winter. In winter the tree is growing less and needs less fertilization. When it is actively growing it needs more. Usually they say to fertilize once a month in winter and twice a month in the growing season. Fertilizing a Bonsai is essential to its health because nutrients in the soil are washed away with each watering. You are right, that in general it is said not to fertilize a weak tree or one with a lot of problems. However, since your tree is weak partly due to lack of nutrients, I would suggest start by giving it a very weak dose of fertilizer, like maybe one quarter strength of label suggestion. Water your tree BEFORE fertilizing. Then when new growth starts, you can start more regular fertilizing. Once your tree is healthy and growing, you are going to need to repot it into good bonsai soil. The soil it is in is all wrong for bonsai. Bonsai soil is very loose and mineral and free draining. Read the articles here http://www.helpfulgardener.com/bonsai/ on bonsai soil, watering, etc. rainbowgardener wrote: I don't know where you got the idea only to fertilize in winter. In winter the tree is growing less and needs less fertilization. When it is actively growing it needs more. Usually they say to fertilize once a month in winter and twice a month in the growing season. Fertilizing a Bonsai is essential to its health because nutrients in the soil are washed away with each watering. You are right, that in general it is said not to fertilize a weak tree or one with a lot of problems. However, since your tree is weak partly due to lack of nutrients, I would suggest start by giving it a very weak dose of fertilizer, like maybe one quarter strength of label suggestion. Water your tree BEFORE fertilizing. 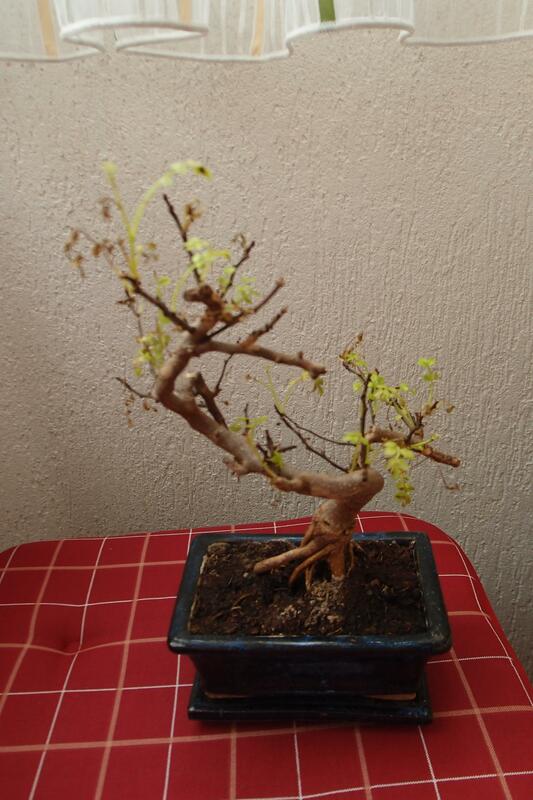 Sorry, it was a typo - I wanted to say that I read about the bonsai should not be fertilized only in winter. I am wondering why the soil is wrong? The thing is, I bought this tree in Seeboden bonsai museum (Austria), and I assumed they put the right type of soil. I will read the article, thanks a lot. Is liquid fertilizer okay? I mean, if I water it and then add the liquid fertilizer, would it be too much of water? Liquid fertilizer is what is recommended. There is no such thing as too much water, especially when you have good free draining bonsai soil. There is only too frequent of watering. But it doesn't really matter how much water you pour through it at one time and it is generally recommended to use plenty to be sure all the soil is moistened. Generally you would pour water on the top until it is running freely out the drain holes. Wait until it quits draining and do it again ("for bonsai it always rains twice"). You can put your fertilizer in the water for the second watering. rainbowgardener wrote: Liquid fertilizer is what is recommended. There is no such thing as too much water, especially when you have good free draining bonsai soil. There is only too frequent of watering. But it doesn't really matter how much water you pour through it at one time and it is generally recommended to use plenty to be sure all the soil is moistened. Generally you would pour water on the top until it is running freely out the drain holes. Wait until it quits draining and do it again ("for bonsai it always rains twice"). You can put your fertilizer in the water for the second watering. When I repot the tree, can I combine perlite and coco peat and put in the lower part instead of this soil? RE: When I repot the tree, can I combine perlite and coco peat and put in the lower part instead of this soil? what did you mean in the lower part? Are you thinking of the old myth of putting gravel or broken pots or whatever in the bottom of flower pots "for drainage"? Does not work. Water does not cross the barrier between layers until the organic layer is completely saturated. You don't want different layers. You want your pot filled with bonsai soil period. I don't think you want very much peat moss. You can use a little peat moss with some bark chips, mixed with something mineral. I guess that could be perlite, but it is pretty light. More often poultry grit, crushed gravel, lava rock, fired clay bits etc are used. or you could just order bonsai soil off the internet to get started. rainbowgardener wrote: RE: When I repot the tree, can I combine perlite and coco peat and put in the lower part instead of this soil? Lower part - I mean the part just under the root, when I remove the old soil? P.S. thanks a lot for the link about the soil!